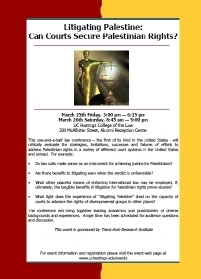 The objective of this one-and-a-half day conference is to critically evaluate the strategies, limitations, successes and failures of efforts to vindicate Palestinian rights in a variety of different court systems in the United States and abroad. This topic is one of both practical and academic significance. As a practical matter, those considering avenues for advancing Palestinian rights need to make strategic judgments about where to invest resources, and whether, in particular, law suits make sense as a tool for justice or not. 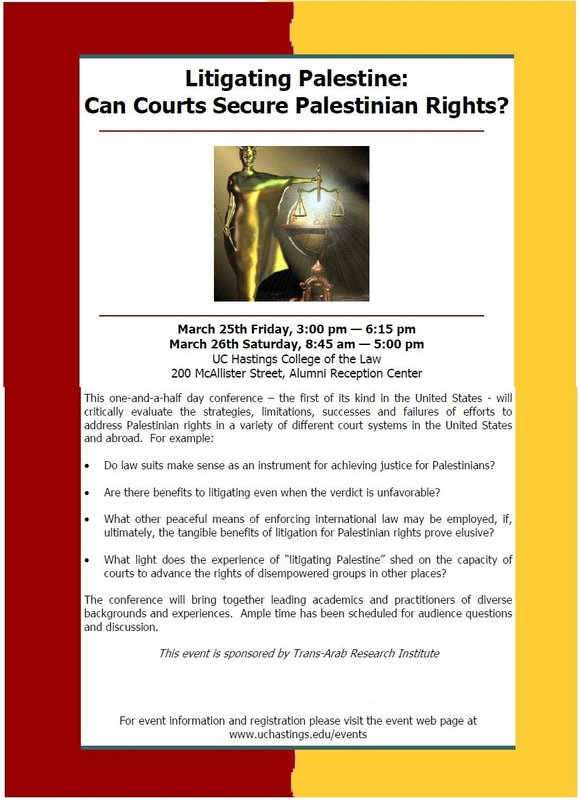 Examining litigation in support of Palestinian rights in a variety of different legal environments should also yield insight on the conditions under which courts can serve the struggles of politically disempowered groups to achieve justice, and thus contribute to broader theoretical discussions as well. The conference will bring together leading academics and practitioners of diverse backgrounds and experiences, and will be the first of its kind to be held in the United States.